Nintendo announced a new IP during their Nintendo direct, making many gamers pay attention. This isn’t another Mario game, but it certainly is a ton of fun, and may just make you need a Wii U. The concept behind Splatoon is fairly straight forward; two teams compete to cover the map with ink, whoever covers more of the map wins the round. However, it goes a whole lot further than that. Your gun can only hold a certain amount of ink. Once you run out, you will need to replenish by going into squid form and swimming through your ink. Be careful of the other side’s ink, though, as that can harm you. Squid form also submerges and hides you, as well as making you move much faster. At first, you have two main attacks – the normal gun as well as a bomb. The bomb covers a large area in ink, and can be thrown quite a way, however it also uses a ton of your ink supply. 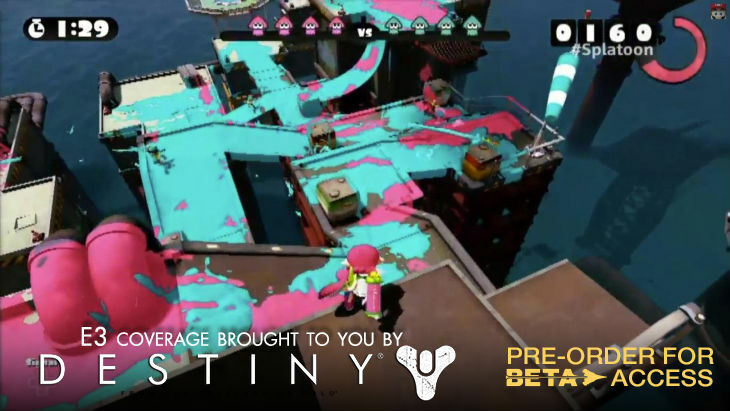 This adds some nice strategy to the game – you may want to spray your way to the high ground, throw a bomb to cover a large open area and then immediately submerge to restore your ink stores. Once your attack gauge is full, you actually get a special attack that spreads a wide spray of ink around the screen with a hurricane/vortex shot that’s available for a short time. Of course, you are not alone. You have teammates and opponents – when I got hands on it was in a 4v4 match. It was such fun to hide in a pool of my ink, only to pop up and shoot the one opponent in the face. Of course, there was more than one occasion when I tried to do that, only to be covered in the opposing side’s ink, getting killed myself. Once defeated, players are returned to the spawn spot on the other end of the map. However, it’s not a matter of running your way back into the fray – with a click tap of the touch screen on the Wii U, you can fly to your teammates’ locations, joining into their battles and lending a hand. This quick travel component seriously speeds up the experience and makes the game much more unpredictable – you never know when a previously defeated player will come flying back into the middle of things. When I initially started playing the game, the motion controls for the Wii U were in use, meaning that I had to tilt the controller to aim up or down. However, it’s evident that not many people enjoy this control system – it can be turned off with a quick click on the Wii U screen’s upper left-hand corner, switching controls to the right analogue stick. The Gamepad is also used as a map of the stage, showing the entire layout as well as the real-time colour distribution so that players can see which team is dominating at a glance. The game is a ton of fun – I thoroughly enjoyed running around and shooting all the things with ink. There is room for a whole bunch of strategy, and I sense that every time you play you’ll want to try out new things. My only complaint about the game (and it’s a small one) is that aiming can feel a bit clunky on the Wii U. It would have been really nice to use a WiiMote instead. However, that could also just be a form factor for me – I generally find the Wii U GamePad difficult to manoeuvre and prefer the ease of use possible with the WiiMotes. We still need to find out more about the game before launch – I’m curious how many people can play together, if players can follow different team configurations, and how many maps will be available. That said, this might just become the best party game out there – it’s fun and goofy, appropriate for gamers of all ages, and has the capacity for a ton of strategy.